There is something very comforting about baking cookies, much more so than most other baked goods in my opinion. Maybe because fresh baked cookies always remind me of childhood. Even as an adult one of my favorite things about the holidays is baking cookies with all of the women in my small family. Until recently I'd only ever heard of Monster Cookies, but since I've been seeing them more and more on blogs, menus, etc. I knew I'd have to try them, and try them soon. 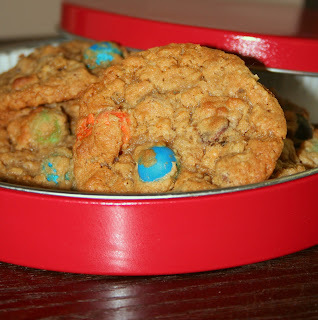 The moment I saw these cookies featuring PRETZEL M&Ms I knew I had to try this recipe. I am very partial to Peanut M&Ms, but I do enjoy snacking on the newest M&M creation that is taking the country by storm - the Pretzel M&M. Plus, my husband LOVES them so I knew I'd get him to sample these cookies by throwing that out there. I admit, I made a mistake with these cookies. I was actually doubling the batch because I had three purposes to bake them for, however after wondering why they weren't really puffing up I remembered that I forgot to double the baking soda. Oops! With that being said, these cookies were still like crack they were so good. Note: the original recipe calls for 1/4 cup raisins added with the M&Ms and chocolate chips, which I omitted because I don't like them. I'm thinking these would be good with Crasins though so next time I make these I'll try that. Oh, and believe me - there will be MANY next times! Preheat oven to 350 F and line baking sheets with parchment paper or silicone baking mats. In the bowl of an electric mixer combine sugars, peanut butter and butter. Beat on medium-high speed until well blended. Mix in the eggs, one at a time, scrapping down the bowl as needed. Blend in the baking soda, vanilla, and salt. With the mixer on low speed, mix in the oatmeal until just incorporated. 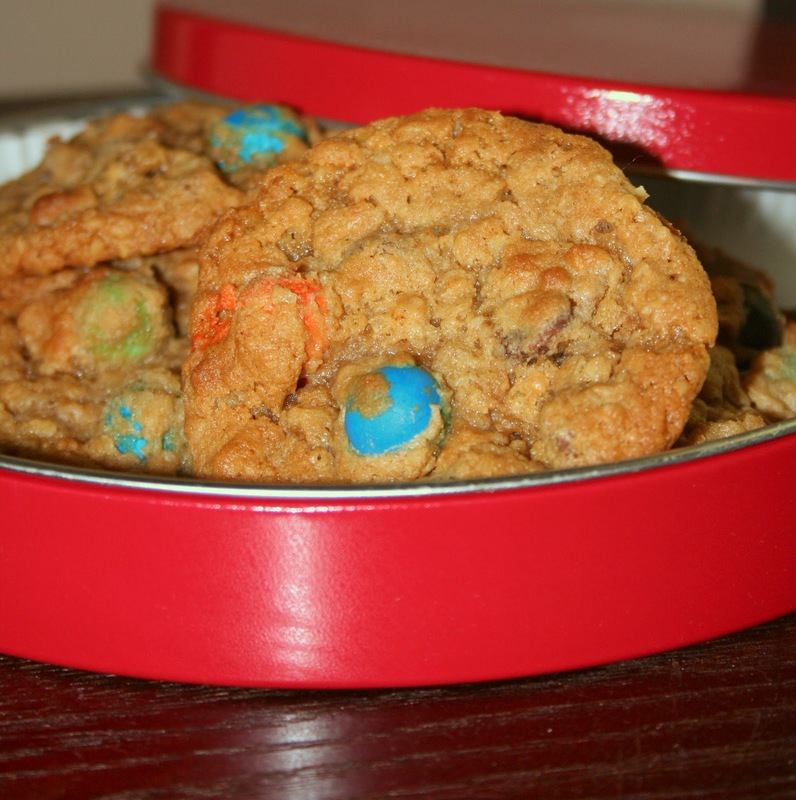 Fold in the M&Ms and chocolate chips with a spatula. Drop heaping tablespoons of dough onto the prepared baking sheets, leaving a couple of inches between each dough ball. Bake 8-11 minutes, until light golden and just set, being careful not to overbake. Let cool on the baking sheets 5 minutes before transferring to a wire rack to cool completely. Store in an airtight container. I have yet to try the pretzel M&M's... sounds delicious! and the cookies look great!! These are my favorite childhood cookie - glad to know their legacy is alive and well! I like the idea of using the pretzel M&M's, too - I've never tried them. Adding to must-try list.